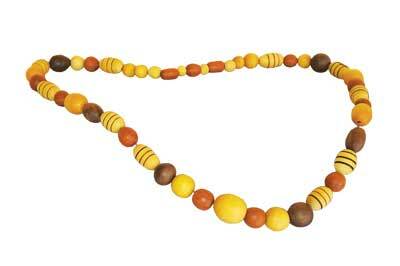 June McKimmie, an Australian woodturner, began turning 15 years ago and hasn't stopped since. As a member of the Sydney Woodturners Guild, June is no stranger to woodturning symposiums, demonstrations, workshops and Turnfest, taking inspiration from all of the woodturners she has met over the years at such events. 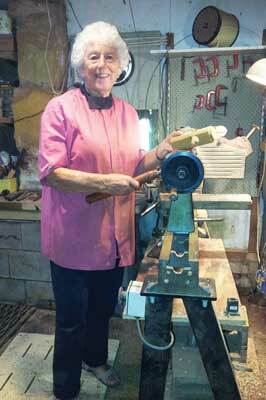 We take a closer look at June's woodworking life. 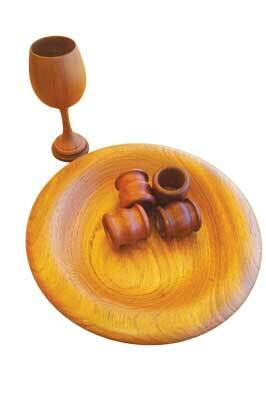 About 15 years ago I overheard a conversation about someone who'd taken a woodturning course. I just had to try it. After four lessons I was smitten. I had my first lessons from John Ewart, who was one of the founders of the Sydney Woodturners Guild over 25 years ago. By the end of the fourth week of lessons, I had made a set of serviette rings, a clock, a dish with a curved rim and a goblet. I then joined the Guild and met with a handful of turners in my locality. I was totally hooked! Just about everyone I have watched and read about has had some influence. Personally I do not aspire to highly decorative or sculptural work. I like to make functional articles in our beautiful timbers, often burls of red gum (Eucalyptus camaldulensis), red mallee (Eucalyptus longicornis), coolibah (Eucalyptus orgadophila) and jarrah (Eucalyptus marginata). I let the wood speak for itself. I would encourage anyone to attend symposiums, demonstrations and workshops, to watch and learn from some of the best. 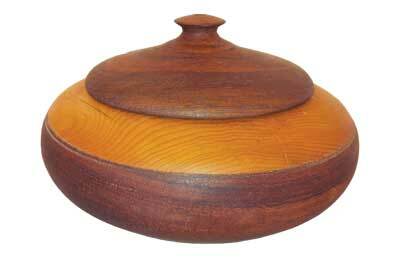 By doing this, you make great friends and enjoy the camaraderie of the woodturning community. I would also advise that there is more than one way to turn, and to not be afraid of experimenting. I love Beethoven symphonies, Mozart concertos and several other classical works. I also love traditional jazz and all kinds of folk music. I don't like crime, fantasy or chicklit, but I do enjoy good fiction, especially by Australian authors. Tim Winton writes wonderful prose but often his stories are a bit dark. Richard Flanagan is also a favourite. I do cryptic crosswords and sudokos. And of course I read Woodturning magazine! This is easy. Not checking the lathe speed before I turned the lathe on. 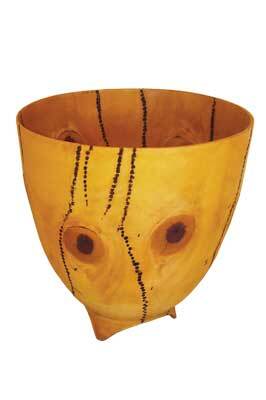 I had a delicate Norfolk pine (Araucaria cunninghamii) hollow vessel, which I had reversed into a heavy jarrah faceplate jam chuck for some finishing touches. I had previously used the lathe at high speed. When I turned it on there was a huge BANG as the faceplate flew apart, and my delicate turning broke into five pieces. I affixed them all together, using CA adhesive, then disguised the glue joints by burning a dot pattern. Unfortunately my tiny workshop only has room for my Teknatool lathe and my grinder. I have my tools on a shelf behind the lathe, and some bench space on the opposite side. There is only 1sq.m of floor space in my workshop. I believe I am the only turner in the world who has her bandsaw in the guest bathroom! Name one thing on your turning 'to do' list. My club is participating in a fund-raising fete for the local hospital. I need to make some small items that will sell. Probably pull-along toys with a revolving ball, such as tortoises, which require four small balls for wheels and a larger one on top. I do not have a ball jig, but will use our Guild motto: "By Hand and Eye." I have recently been given some pieces of 100-year-old fence posts from a farm. I am making them into table lamps. I have cleaned, sanded and oiled them, and turned tiny mushrooms from driftwood to put in some of the cracks. Obviously my lathe, my tools and my grinder. But apart from these, I think I could not do without my hot glue gun! It allows me to hold wood in unusual ways, and it is a very trustworthy attachment device. However, as far as possible I always have tailstock support. I would like to have been a professional woodturner. I am 79 years old now, and I get more satisfaction from my hobby than I ever did in my career as an educational psychologist and school counsellor. By this, I mean I enjoy the instant feedback after putting a lump of wood on my lathe and turning it into something useful and beautiful, in a fairly short time, whereas the results of my counselling may not be known for years, if at all! What is your favourite type of turning. My favourite kind of turning would have to be any kind of bowl. The variety of design and purpose is endless. Finding the most aesthetically pleasing form can be a challenge, but it is so satisfying when I feel I've got it right! I guess I wish I continue to remain physically strong and fit enough to keep enjoying my woodturning hobby for many years to come. If you could have one piece of equipment what would it be, and why? There really is no room in my small workshop for other equipment. 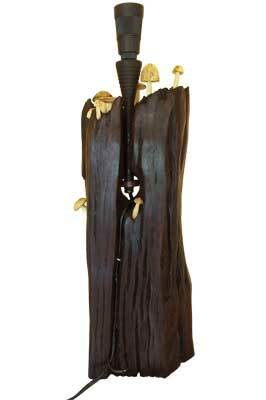 There is no denying that woodturning creates an incredible mess and it is very difficult to keep things shipshape. If I had the ceiling space, I would dearly love a powerful overhead dust extraction system, but instead I have to make do with a small air filter. I haven't used many jigs made by myself. A few years ago, I tried my hand at offcentre turning on the first Escoulen chuck, although not very successfully. 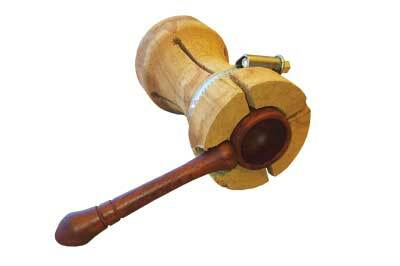 I bought one but have not persevered sufficiently to become familiar with its use, which is for spindle turning. I have had more success with using hot glue on a faceplate for varying the centre for lattice work. 7. Try using hot glue to help attach your work to a faceplate. It is amazing! 1. The smell and feel of wood, and the surprise when you see what is under the bark!